SAN ANTONIO, Texas – The Gustavus volleyball team wrapped up play at the Trinity National Invitational on Saturday with a pair of wins to improve to 3-1. The Gusties beat Aurora 3-1 and then swept Cabrini in straight sets. In a rematch of the 2017 NCAA first round matchup, the Gusties repeated their performance from last year by winning in four sets, 17-25, 25-14, 25-9, 25-22. Aurora took an early 4-1 lead in the opening set and never trailed. The second set saw Gustavus jump out to the early lead, 8-2, as it cruised to an 11-point decision. The third set was even more decisive in a 16-point difference. The clincher came in the fourth frame, but it was much more evenly-matched with five lead changes. The Gusties ended the set with an 8-4 run. Gustavus hit .312 on the attack, led by Kate Holtan’s (So., Rochester, Minn.) and Hanna Albers’ (Sr., St. Louis, Mo.) 12 kills apiece. Kate Holtan added 14 digs for a double-double. Nora Holtan (Sr., Rochester, Minn.) had 36 assists and Brittany Luethmers (Sr., Prior Lake, Minn.) posted 22 digs. The Gusties closed out the tournament with a clean sweep over Cabrini, 25-17, 25-21, 25-13. Gustavus fought back from an early 5-1 deficit in the first set, stringing together nine-straight points for a lead they would not give up. The Gusties controlled the second set after a brief 1-0 deficit to climb in front and stay there for the rest of the frame. The third set saw the Black and Gold go on a 9-1 run early on and then hold on to complete the shutout. The Gusties hit .308 on the attack and limited Cabrini to a -.032 percentage. Kate Holtan once again led the team with 12 kills. Nora Holtan tallied 26 assists and 12 digs for a double-double. She was two kills shy of a triple-double. 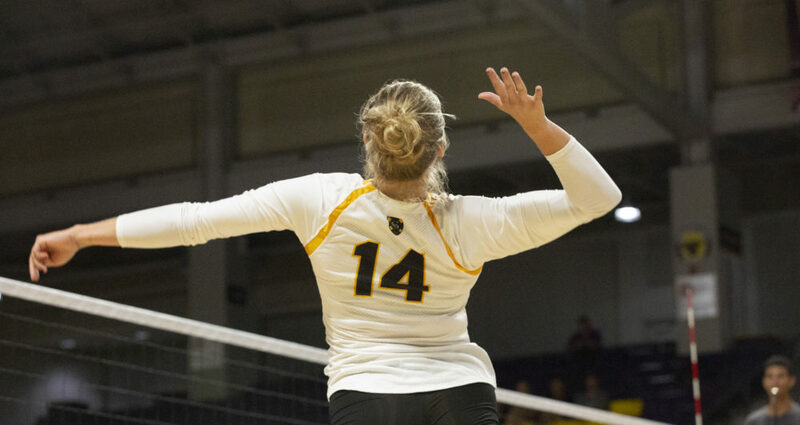 Four Gusties registered double-figure digs, led by Luethmers’ 15. Nora Holtan and Luethmers were named to the All-Tournament Team. Gustavus next travels to Dubuque, Iowa next weekend to play four matches in the Loras Invite.